ONE LINE :- This article is about the life of great Jodha banda Singh Bahadur of Sikhism. Today’s story of the brave heart person which will remember till end of the world. His name is SARDAR BANDA SINGH BAHADUR, his name take respectably in Sikh religious. History of this person is very horrible “ LACHMAN DEV ” is a first name of him. October 27 1670 is his birth date and 9 June 1716 the death time. 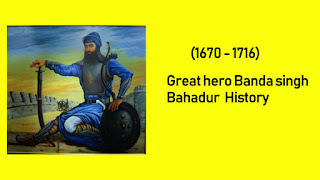 His first major action was the shocking of the mugal provincial capital samana,in November 1709.He was very danger solder and leader “BANDA SINGH BAHADUR’’ developed the village of Mukhlisgarh and made it his capital. BANDA SINGH BAHADR meet in Maharashtra to Sikh Guru Sheri Guru Gobind Singh JI he take permission from guru ji for come to Punjab and for attack before this by the Guru ji told him story of Punjab. On 12 may 1710 in the Battle of Chappar Chiri the sikh killed wazir khan, the governor of sirhind and “DEWAN SUCHANAND’’ who were responsible for the “ MARTYRDOM ” of the two youngest son of Shri Guru Gobind Singh Ji two day latter the Sikh captured sirhind his name is Banda Singh Bahadur gave by Guru ji the name was show his. an will ever. Banda made very dangers for the Mughal Empire. In the samana 10,000 mohammedans Killed by his army. After the sirhind he was more powerful after victory of won the kings of mountain kings when BANDA SINGH BAHADR came back. Then he surprised when he see the most powerful army of mughal empire under the frukh shiar and abdus samad khan. In March 1715, the army mughal king of delhi, drove BANDA SINGH BAHADR and the Sikh forces into the village of gurdas Nangal Gurdaspur Punjab and laid siege to the village. the Sikh defended the small fort for eight months under conditions of great hardship, but on 7 December 1715 the mughals broke into the starving garrison and captured BANDA SINGH BAHADR and his companions. In his alive the time he killed all the enemy who deserve death. According his name he is ever green soldier. Like other Sikh soldier without this in the Sikh history more powerful and more dangerous in the world. Sikhism will be ever feel proud take their history and we also. LIST OF VISHV TRADING GENERAL KNOWLEDGE BOOKS YOU CAN ALSO READ.